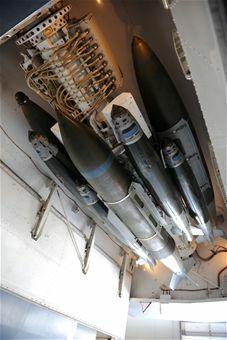 An assortment of 500-pound and 2,000-pound joint-direct-attack munitions are connected to a multiple ejector rack on a B-1B Lancer March 31, 2011, at a weapons load barn at Dyess Air Force Base, Texas. 4/11/2011 – DYESS AIR FORCE BASE, Texas — Airmen from the 337th Test and Evaluation Squadron began their first phase of demonstrations of a multiple ejector rack on a B-1B Lancer here March 22. If fielded, 16-carry modified rotary launchers will increase the number of 500-pound joint direct attack munitions and laser-guided JDAMs carried by the B-1B from 15 to 48, a 320 percent increase in capability. “Currently a B-1 can deliver twice the payload of a B-52 (Stratofortress), meaning, theoretically, with the MER upgrade, one B-1 will be able to deliver the same amount of payload as four B-52s,” said Col. Gerald Goodfellow, the 7th Operations Group commander. Also, the MER has a mixed-load capability, meaning each bomb bay can hold an assortment of joint air-to-surface stand-off missiles, and both 2,000-pound and 500-pound JDAMs, giving the aircrew much greater flexibility during combat missions. “The war we are in requires target specific weaponry that is capable of destroying a single room of a building,” said Tech Sgt. David Koscienski, the 337th TES weapons suitability NCO in charge. “With the addition of the MER, B-1 operators have the ability to conduct numerous individual attacks and massive air-strikes as needed, without needing to stop to reload.” Aircrews from the 337th TES and 419th Flight Test Squadron from Edwards Air Force Base, Calif., flew a Dyess AFB B-1B equipped with a MER and successfully released two inert 500-pound JDAMs over China Lake Missile Range, Calif, March 22. An additional mission was also successfully flown March 24 to test drop the weapons again. “The B-1 is absolutely a choice war-fighting platform considering it can carry multiple weapons, each with specific capabilities, and deploy those weapons at a moment’s notice,” Sergeant Koscienski said. “The adaptation of the MER, along with the sniper pod and laser-guided JDAMS, will only increase that same lethal capability to an even greater level.” The purpose of the 16-carry demonstration program is to validate the release and safe separation of 500-pound class weapons from a modified B-1B rotary launcher. “This upgrade will not only save the Air Force money, but will also put less of our Airmen at risk; and that is our main priority,” Colonel Goodfellow said. This entry was posted in Hobbies and Toys and tagged aircraft replicas, airplane models, Collectibles, desktop models mahogany models, diecast model airplanes, Hobbies and Toys, military models. Bookmark the permalink.